When you choose to buy a conservatory it’s important that you ask if the installation is included in the price you’ve been quoted. Usually it will be, but it’s best to avoid the potential of any nasty shocks further down the line. There are many companies in the UK who manufacture conservatories for people to put together themselves, but you’ll need a very good level of DIY skills to be able to do it properly. Your conservatory will have to comply with certain building regulations so it’s very important that you are aware of these before you start construction. If you have bought a conservatory kit, then it’s best to get an experienced conservatory installer to put it together for you. This will not only save you time but it could also mean the difference your conservatory being fit for purpose or not. There are regulations regarding the type of windows and doors you should have fitted in your conservatory, so if you’re in any doubt about the work that’s being done, you should check online to see exactly what these are and if yours comply or not. Having a conservatory installed at your home can be disruptive to your daily routine, especially when the new doors are being fitted but it’s good to be around if you can to monitor progress and take issue with anything you’re not happy with. Consumer tip: Remember to inform your insurance company that you’ve had a conservatory built on to your existing home as you will need cover for rebuilding costs in case the worst was to happen. It is thought that around 60% of conservatories built in the UK require planning permission. There are a number of criteria which determine whether or not your conservatory will need planning permission or not but it is always wise to double check with your local authority. The planning process Once you’ve chosen a company to build your conservatory they will usually be able to advise you if what you have in mind will require planning permission or not. If your conservatory does need permission, then the conservatory company will normally draw up and submit the plans to the relevant local authority on your behalf. A reputable and experienced firm should have a well-established relationship with the local planning department as well as an excellent knowledge of what is likely to get approval and what isn’t. 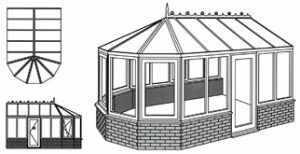 Consumer tip: When getting quotes for your conservatory you should ask advice on planning permission so that if you do need it, you will have a better idea of timescales for completion of the work.